Mukul Deva’s ‘Lashkar’ series has many incidences which have later coincidentally appeared in real life. One such uncanny description is how ‘Osama is taken by US forces’ which is part of ‘Salim Must Die’, the book two of the series. Now that the series is reading more and more like non-fiction, we asked Mukul Deva to give us his views of recent dramatic events and how they are reflected in his books. CBF: Seriously how did you come up with the idea of the Americans kidnapping Osama? After all, at one level it does constitute an international crime? An assembly of minute details observed with a sensitive eye and put together in a series of stories that celebrate every day life. 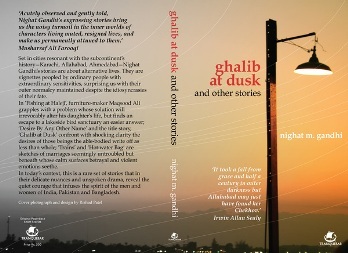 Nighat Gandhi’s Ghalib at Dusk is noteworthy because of the fact that the author manages to put her finger on the common pulse that unites daily life in Pakistan and India. The stories crisscross places and cultures, travelling from Karachi to Ahmedabad and Allahabad, towns that are out of the mainstream bustle. They also traverse emotional tangles and domestic dilemmas and the contrast between outward life and inner emotions. This is most apparent in the story that gives the collection its title, the tale of the partially handicapped Babar who lives with his sisters and is a Ghalib aficionado. 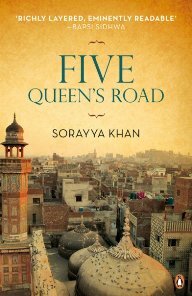 In the first ever author’s interview on Curious Book Fans site we talk to Sorayya Khan, author of novels Noor (2003) and Five Queen’s Road (2009). She was born in Europe, grew up in Pakistan and now lives in the US. She received a Fulbright award and Constance Saltonstall Foundation Artist Grant. Her story, “In the Shadows of the Margalla Hills,” won the 1995 Malahat Review First Novella prize. Her work has been anthologized in several collections, including Bapsi Sidhwa’s City Of Sin And Splendor: Writings On Lahore. Intrigued by her splendid family saga Five Queen’s Road and her internationally diverse background we were very curious to hear more from Sorayya herself. CBF: Whilst reading Five Queen’s Road I had you earmarked as the daughter of the Dutch mother and Pakistani father who feature in the story. Are these characters based on your parents and did Five Queen’s Road and the families that lived there really exist? 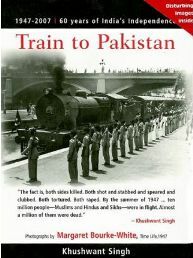 The Train to Pakistan is a fictitious account of the impact of Partition – the splitting of India into the two states of India and Pakistan in 1947 – in a small country town called Mano Majra which sits beside the railway line. All the events described are based on fact but delivered as fiction. It’s fair to say that you couldn’t make it up if you tried – nobody would believe this if it wasn’t documented, photographed and proven to be true. My copy of The Train to Pakistan is the 50th Anniversary Special Edition in which Khushwant Singh’s classic story is illustrated with the photographs of American photographer Margaret Bourke-White. 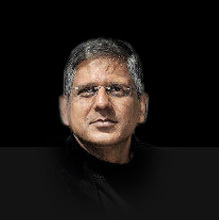 Pramod Kapoor (who wrote the introduction to the edition) had the creative idea to bring together the words of Singh and the photographs of Bourke-White, correctly identifying that the synergy between the two would create a stunning and very moving tribute to both and to those killed during the events that form the focus of the book. It’s worth noting that the anniversary referred to is that of the original publishing of the book and not of the events themselves. In 1947 Earl Mountbatten, the last Viceroy of India, signed on the dotted line to give independence to the nation of India and like so many of the British living there, he prepared to pack his bags and head home. The transition from the old administration to the new was not simple. The large red ‘blob’ on the world map which represented the India of Empire days was torn apart by two new lines forming the boundaries between Hindu-majority India and her newly-formed Muslim neighbours, East and West Pakistan. In just a couple of sweeps of a pen, the face of India lost her ‘ears’ in the Partition and tens of millions of people found themselves on the wrong side of the line. Chaos and carnage ensued with millions left dead and many millions more made homeless as they left behind everything they’d built over many generations. The Partition is a strong and oft reworked theme of the literature of the sub-continent but in Sorayya Khan’s novel, Five Queen’s Road, the more typical tale of leaving is replaced with one of the determination of a stubborn man to stay behind in a hostile country.